RAISE UR PAW NEWS: EXCALIBUR: CAN ANIMALS GET EBOLA? EXCALIBUR: CAN ANIMALS GET EBOLA? CAN ANIMALS GET EBOLA? AND IF SO CAN IT BE TRANSMITTED TO HUMANS? This question seems to be playing on the minds of countless individuals, especially when reports broke out about the proposed euthanization of a dog named EXCALIBUR, owned by a spanish nurse who is infected with the illness Ebola. As the news flooded the airways and social media, it created a storm of outcries from thousands of animal angels trying desperately to save the life of this innocent being - even creating a petition which apparently reached 300,000 signatures. However, these outcries fell upon deaf ears as a Government Health Spokesperson confirmed the death, explaining "Unfortunately we had no other choice!" ... but did they? Did Government Health Officials have another choice, considering that there are speculations that Excalibur was not tested or quarantined for this virus, and was merely a victim of the Ebola panic - that due to the fear of this virus being transmitted further, and theories that dogs can transmit this virus to humans cost an innocent animal his life? is there any proof that Excalibur was even infected at all? 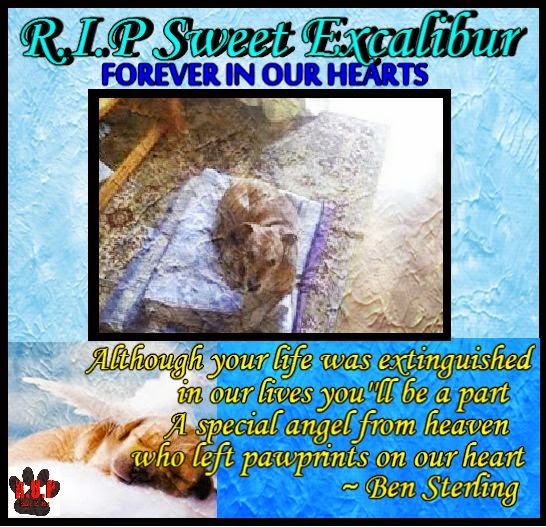 As detailed in some articles that I have read, Excalibur was put to sleep in the owner's home, and the home had to be disinfected before he could be removed - and as officials took Excalibur's body from the residence, many stood outside chanting "murderers" while enforcement had to clear the way so that his body could be put into a white van and taken to a nearby incinerator to be disposed of. I cannot imagine the heartbreak and stress that these owners endured - not only being infected by this virus, but also seeing their beloved companion destroyed, because of this fear - to have their pleas and cries to not kill their treasured family member rejected & ignored - it truly brings tears to my eyes even thinking of it. Although outrage & tears cannot bring back this innocent life, spreading the awareness & this situation worldwide can perhaps help protect other innocent life that may become in danger due to this fear - to bring upon the importance of testing & quarantine so that no one else has to lose their companion friend, and no companion friend lose their life. We want to know your opinion on this situation? FUR CHALLENGE: Fashionable or Cruel?